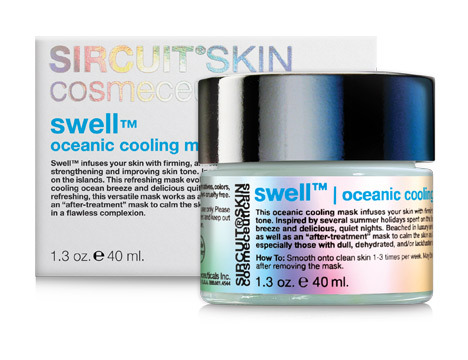 Oceanic cooling mask from Sircuit Skin Cosmeceuticals. It infuses your skin with firming, antioxidant and anti-aging benefits, while helping to strengthen and improve skin tone.The mask can be used for anti-aging purposes, or as an after treatment to clam the skin. It is made with Caviar extract, Pearl Powder, Organic Aloe, and Sea Buckthorn extract. The Menthyl Lactate gives the cooling tingling feeling. This feeling lasts even after you wash it off. I like to spray on their Molecular Mist when i remove the mask. It also infuses the skin with antioxidant and anti-aging benefits. Pepha®-Tight (Pullulan, Algae Extract) – provides an immediate skin tightening effect as well as a long-term effect by protecting skin cells from oxidative stress and helping to strengthen skin connective tissues. So undo stress with Swell, and maybe something else….